Super Savings Item! Free Shipping Included! 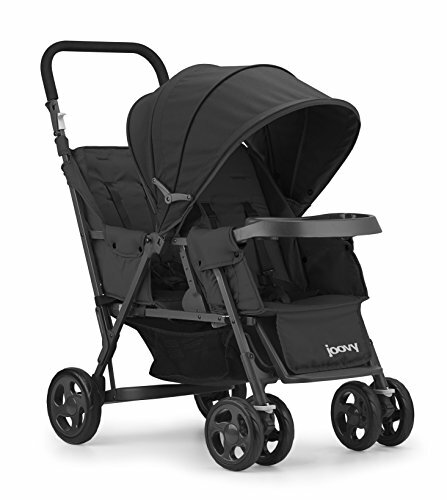 Save 32% on the JOOVY Caboose Too Graphite Stand-On Tandem Stroller, Black by Joovy at Baby Stroller Car Seat Combo. MPN: 8167. Hurry! Limited time offer. Offer valid only while supplies last. The Joovy Caboose Too Graphite stroller has all of the same great features of our Caboose Graphite stroller PLUS it includes a full-size rear seat. The Joovy Caboose Too Graphite stroller has all of the same great features of our Caboose Graphite stroller PLUS it includes a full-size rear seat. The full-size rear seat is removable and accommodates children too young (less than 2.5 years) to use the rear bench seat and standing platform. The full-size rear seat has a multi-position recline and holds a child from 6 months to 45 lbs. The front seat accommodates a child from 3 months to 45 lbs. and reclines to 3-positions. Max child weight in stroller is 90 lbs. When strolling with an infant, it's easy to create a travel system with the included universal car seat adapter. The large canopy provides ample coverage for both children when seated. Linked parking brakes and all-wheel suspension offers your kids a smooth ride. The Caboose Too is extremely compact and weighs less than most double strollers. It weighs just over 29 pounds with the rear seat installed. The small footprint makes the Caboose Too Graphite extremely maneuverable - especially for a double stroller. Includes Joovy' s 2-year manufacturer's warranty. Rear bench seat and standing platform holds child 2.5 years and up to 45 lbs.